Since his boyhood in a poor village in Central Anatolia, Mevlut Karatas has fantasized about what his life would become. Not getting as far in school as he'd hoped, at the age of twelve, he comes to Istanbul-"the center of the world"-and is immediately enthralled both by the city being demolished and the new one that is fast being built. He follows his father's trade, selling boza on the street, and hopes to become rich like other villagers who have settled on the desolate hills outside the booming metropolis. But chance seems to conspire against him. He spends three years writing love letters to a girl he saw just once at a wedding, only to elope by mistake with her sister. And though he grows to cherish his wife and the family they have, his relations all make their fortunes while his own years are spent in a series of jobs leading nowhere; he is sometimes attracted to the politics of his friends and intermittently to the lodge of a religious guide. But every evening, without fail, he still wanders the streets of Istanbul, selling boza and wondering at the "strangeness" in his mind, the sensation that makes him feel different from everyone else, until fortune conspires once more to let him understand at last what it is he has always yearned for. 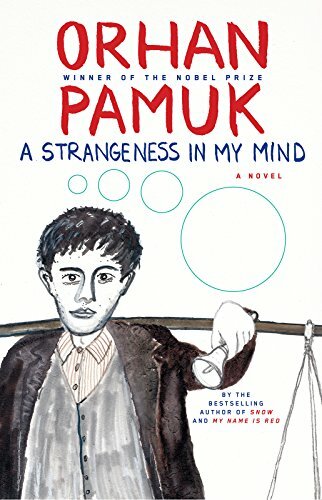 Told from the perspectives of many beguiling characters, A Strangeness in My Mind is a modern epic of coming of age in a great city, and a mesmerizing narrative sure to take its place among Pamuk's finest achievements.